My mom walks for 30 minutes every day. It’s a new thing she’s been doing lately, and I’m so proud of her. When I was home for the holidays this year, I decided to join in on the fun. It’s not simply that my mom walks every day, it’s that she also brings her 2 chihuahuas and 1 toy poodle along for the fun. Picture it now: two women that are both around 5 foot tall, 3 teeny tiny dogs (each in a teeny tiny sweater, since it was December! ), parading down the middle of the street in a small, suburban town in New Jersey. Watch out you guys! Anyway, when I got back to Seattle after the holidays, I decided to do the same (30 minute walks) on the days I don’t go running. Today was one of those days. And walking in Seattle in January means one thing: rain. And that’s alright, because it helped me figure out what I wanted to make for dinner tonight: soup. Rain = soup. Soup is best on rainy days. Rainy cold days. I don’t know about you, but I always make sure to have canned beans on hand. Black beans, white beans, kidney beans, pinto beans.. you name it. They are like little miracle workers on those nights when you just don’t want to schlep to the grocery store. Especially on cold and rainy nights. Especially after you’ve already gone on a 30 minute walk in the rain. Those are also the nights I like to pretend I’m on Chopped. Or some kind of super-money-saving reality show, or something. Let’s make those pantry staples really shine, people! 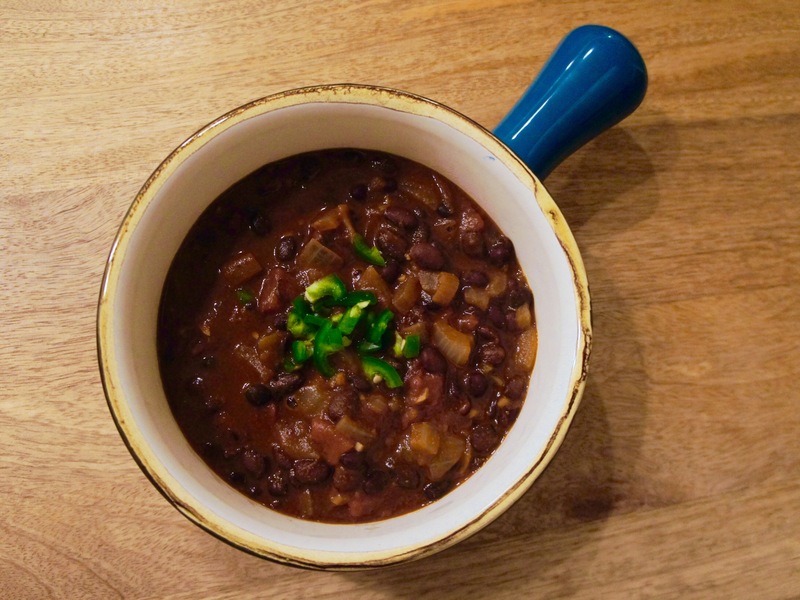 Throw in some chipotle peppers and cocoa powder and you’ve got yourself a soul-warming bowl of happiness. I hope you enjoy it. And if it’s winter where you are, I hope you’re staying warm (and dry!). 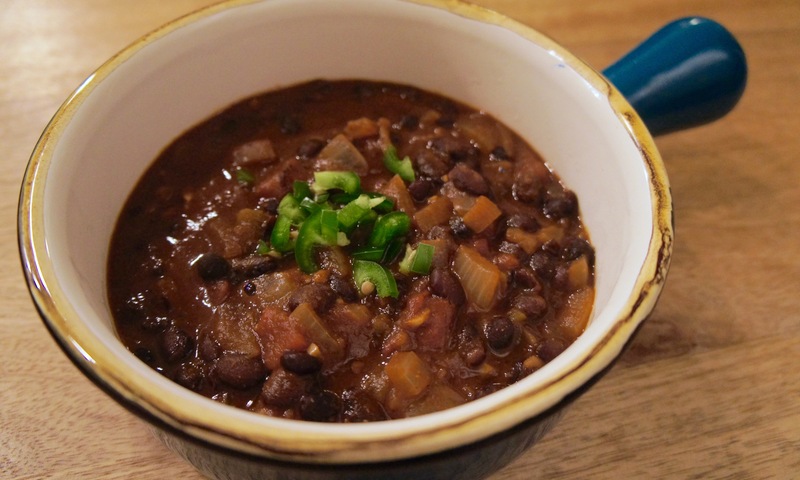 A spicy, warming, black bean soup perfect for a cold, rainy night. Peel and dice onions. Mince garlic. Clean and mince jalapeño pepper. Drain black beans. Heat coconut oil in a large heavy pot over medium heat. Once hot, add the onions and sauté for 5-10 mins until translucent and starting to brown. Add salt and pepper and stir. Then add tomato paste, chipotle pepper with sauce, 1/2 diced jalapeño pepper, garlic, cocoa powder, cumin, cayenne, and coriander. Cook, stirring frequently, until fragrant and tomato paste starts to brown (about 1-2 mins). Stir in diced tomatoes, 2 cups vegetable broth, black beans and bay leaf. Bring to a boil, reduce heat and simmer, partially covered, for 20-30 mins. Once flavors have melded, add more broth if soup is too thick. Season with salt and pepper to taste. Top soup with the remaining diced jalapeño and fresh lime juice. Serve. Additional toppings: diced avocado, cilantro, plain Greek yogurt, shredded sharp cheddar cheese, crushed tortilla chips, pickled jalapeños.